The Visual Landing Aids are specifically designed to meet the requirements of larger Carrier type vessels operating both rotary and fixed wing flight operations. The GLIDE SLOPE AND LONG RANGE LINE-UP INDICATOR SYSTEM (GLIS), incorporating two ASGSIs, has been developed by AGI to satisfy a requirement for an NVG compliant system that replaces Deck Approach Projector Sight (DAPS). This system may be used by pilots flying with NVDs, who are making their final approach to an aircraft carrier or similar sized naval vessel. The two ASGSI projectors, situated one fore and one aft on the port side of the flight deck, provide a long range line-up indication. Intensity calculations indicate that the viewing distance would be a minimum of 2NM depending upon prevailing meteorological visibility conditions. Operational experience has shown that the viewing distance is often considerably greater, with reports of 5NM not being uncommon. The beam projected by the two ASGSI’s is vertically colour-coded, as well as incorporating different occulting rates in the upper and lower sectors. On the correct glide slope, both ASGSI’s shall indicate a steady green signal to the pilot. Deviation from the correct glide path, results in one or other projectors being seen as a flashing colour, the flashing rate of which is dependent upon whether the deviation is high or low. The system may be used with equal effectiveness either with or without Night Vision Devices (NVD) and has been described as an intuitive replacement for DAPS. 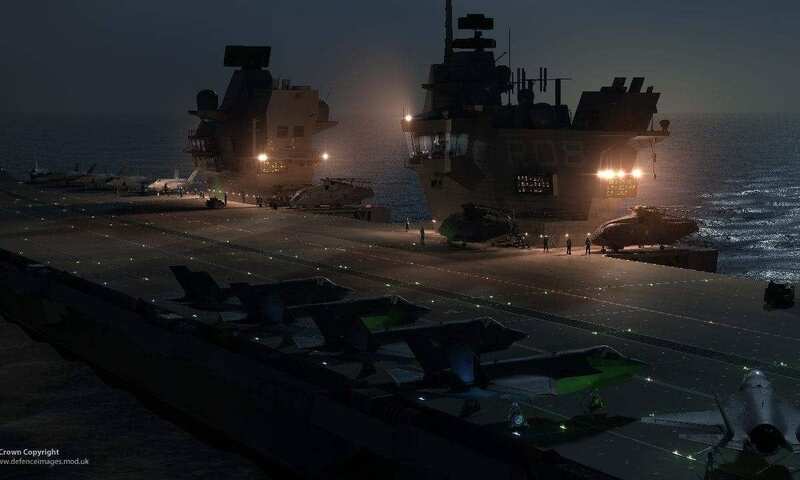 The HIHAT system is a lighting solution developed for installation on aircraft carriers or other similar sized vessels, that will provide a clear, intuitive and NVD friendly indication of hover height and relative ship movement to the pilot in the side hover position. The viewing angle of the system is significantly wider than other similar traditional systems currently in service. For optimum performance, it should be mounted on the side of the ship’s island, overlooking the flight deck, in a location that will allow visibility to a minimum number of three deck landing positions. SAFE DECK PARKING Lights indicate to the pilot where it is safe to park aircraft once they have completed flying operations. LONG RANGE ACQUISITION Lights allow high speed jet aircraft to acquire visual recognition of the flight deck from increased distances. ISLAND CEREMONIAL FLOODLIGHT Units illuminate the island superstructure. CATWALK lights are used to safely illuminate the catwalk areas around the outside of the flight deck. FLIGHT DECK ACCESS lighting indicates safe entry or no entry to the flight deck for ships personnel. HIGH INTENSITY WAVE OFF Lights are for use in Fast Jet operations where the Wave Off light needs to be seen over a greater distance to allow abortive action to be taken.